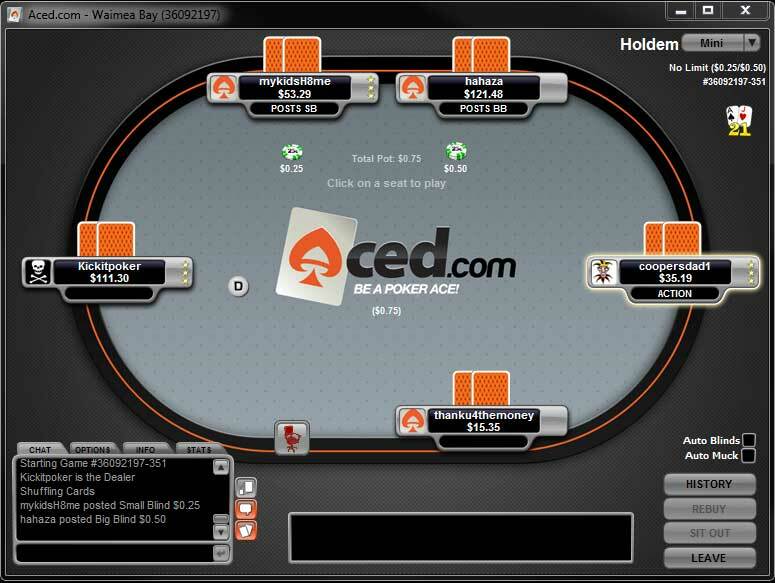 Aced Poker is the little brother of Carbon Poker both online poker rooms are on the Merge Gaming Network, and is popular choice for USA Poker players. The software features slick graphics and offers players the all the latest features players require to play an enjoyable game of online poker. 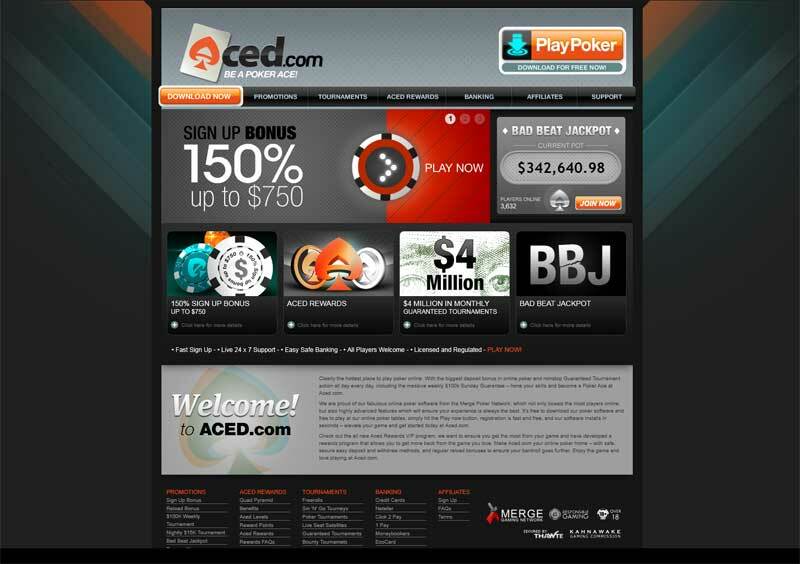 AcedPoker offers players a bigger deposit bonus than most poker rooms, get a 150% first deposit up to $750 when using Aced Poker bonus code ACEDWAP valid April 2019. 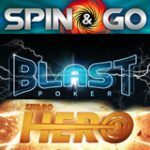 Aced Poker Bonus Code ACEDWAP- get a 150% deposit bonus up to $750 for your first deposit at AcedPoker. 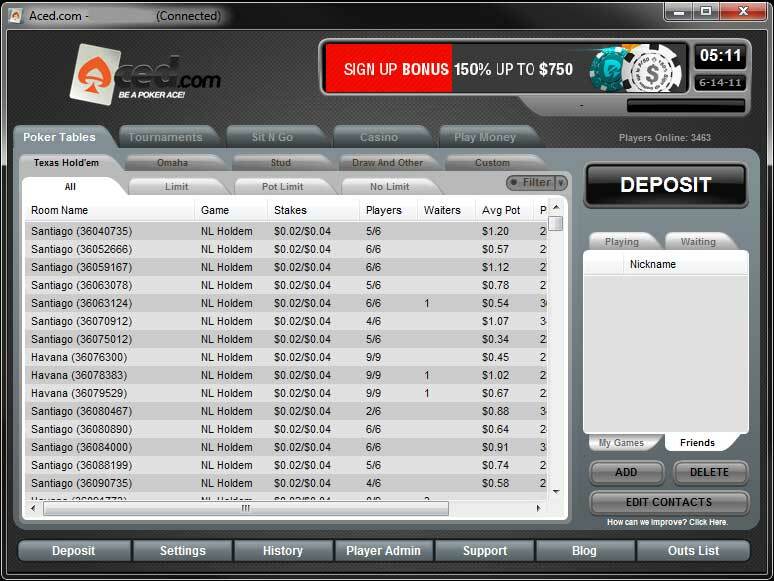 Aced Poker have been on the scene since 2008 and shares the same network as Carbon Poker offering the same excellent poker software and online poker games. The Merge Network has the most USA Poker traffic due to several of the bigger poker rooms blocking players since Black Friday, the network offers a great alternative for US players to play poker online. The software has some unique features which enhances the players experience, these features include: Deal it Twice, Rabbit Hunt, Expose One Card, Time Bank, Player accolades and players can use Poker Similes which adds an animation when typing certain words into the chat. Because Aced Poker accepts USA Poker players and are based on the Merge Network currently the largest network accepting US players. There is approximately 3000-5000 players online in peak times but this is expected to increase until the US government finally regulates and licenses online poker. 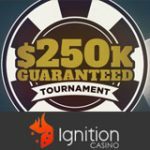 Players can play more than $4 million in guaranteed tournaments every month with the weekly $100k tourney being the largest tournament on offer. 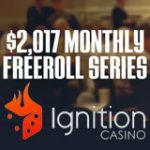 There are also five daily Aced Poker freerolls which have a $200 prize pool and are free for all players to enter with no deposit required to play, depositing players also get free entry into the $500 Depositor freerolls for 14 days. 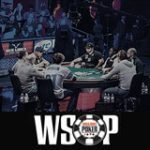 Aced Poker also offer Live Seat Satellite tournaments where players can win their seat to major live poker events which includes the WSOP, WPT or Aussie Millions. A wide variety of poker games are on offer besides the popular Texas Holdem Poker, players can practice other games such as Omaha, Stud or Razz. Aced Poker also has online casino games where players can also play Blackjack, Roulette, Caribbean Stud and Video Poker. Aced Poker is known for have some very loose players which can be very profitable when playing against the inexperienced players, however players skills seem to increase at higher limits. Aced Poker have regular poker promotion where players can win extra cash playing leaderboard or Rake Races, other promotions include: Royal Flush Bonus, Tourney King and Bad Beat Jackpots. Aced Rewards is an excellent poker rewards program which offers players bigger and better rewards the more they play. The rewards include: Daily Aced Cashback Rebates, exchanging VIP points, VIP points store, freeroll tournament entries and players also receive a Aced Coupon on their birthday which can be used to enter tournaments. The Aced Poker minimum deposit is only $10 when using one of the online payment solutions. 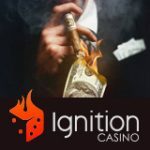 Players can clear their first deposit bonus by earning VIP points playing real money poker games, players can clear their bonus at a rate of 75 VIP points per $1. The Aced Poker bonus is released in increments of $5 and must be cleared within 90 days of making a first deposit. Traffic could be better but the room is growing rapidly. AcedPoker also offers Blackjack, Caribbean Stud, Roulette and Video Poker.